The difference between a house and a home starts with C. Weber Builders Inc. Every job is equally important to us, no matter the size or location. We are dedicated to complete customer satisfaction, making the building process enjoyable for you from the start and providing a valuable asset with your custom home. As your Walworth County home builder, we know we are dealing with the largest investment most of us ever make. The look, feel, and quality of your home will be a major contributor to you and your family’s lives and happiness for years to come. We won’t settle for anything less than our best, and we don’t expect you to either. No two building projects are the same and the complete process varies for each home. As your trusted contractor, we believe communication is the key to success. C. Weber Builders Inc. will work with you closely throughout the entire project, keeping the communication steady and open to make sure your dreams are brought to life. As your Southeastern Wisconsin custom home builders, we will personally meet with you to discuss the potential project and gain a complete understanding of what you want. During this time, we will be able to gauge a realistic budget and make sure your desires are achievable within your personal budget limits. 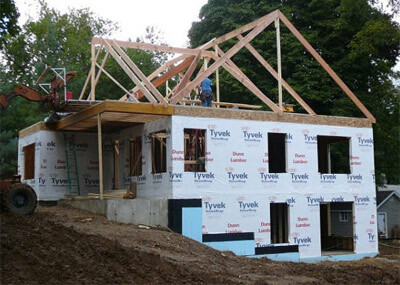 We will then make a visit to your desired home construction site in Walworth, Lake Geneva or a surrounding area. It is important for each new home to be designed for the specific site it’s being built on. Local zoning ordinances need to be fully understood and every piece of land possess unique factors that could affect the function, form, and cost of a particular construction project. We are highly skilled and experienced in scoping out any and all factors, and ensuring nothing is missed or over-looked. Once the potential project and construction site are evaluated, we will begin generating plans for the work and discuss your custom home’s specific mechanical systems in detail. As your Walworth County and Lake Geneva home building experts, we will ensure everything is taken into consideration and there is a thorough understanding of the project at hand. Our top priority is to create the house of YOUR dreams. We establish your overall costs and complete a firm financial contract, bringing you one step closer to having the home of your dreams. C. Weber Builders Inc. will then start to construct your Walworth County custom home, or begin your renovation project according to the detailed plans we’ve developed with you. We work with reliable sub-contractors, suppliers, lenders, and local officials throughout the project, while remaining in constant contact with you to ensure your new Walworth County home building is a success and to your complete satisfaction.